Direct reduction processes can be divided roughly into two categories: gas-based, and coal-based. 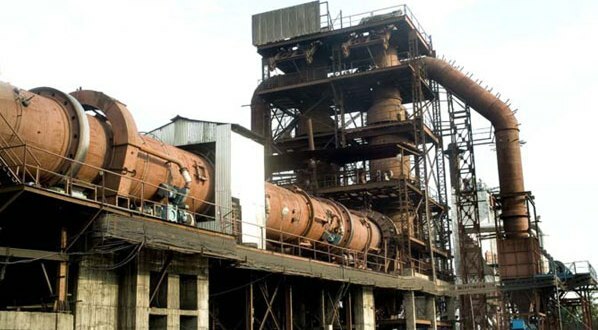 In both cases, the objective of the process is to drive off the oxygen contained in various forms of iron ore (sized ore, concentrates, pellets, mill scale, furnace dust, etc. ), in order to convert the ore to metallic iron, without melting it (below 1200 °C). The direct reduction process is comparatively energy efficient. Steel made using DRI requires significantly less fuel, in that a traditional blast furnace is not needed. DRI is most commonly made into steel using electric arc furnaces to take advantage of the heat produced by the DRI product. Ashoka Group is known for quality equipments in heavy industrial plants, We are largest manufacturers of sponge iron plant & equipments in India and supply Sponge Iron Plant Equipments worldwide. With years of experience, Ashoka Gears has supplied a large range of equipments for sponge iron plants starting with 50 TPD, 100 TPD, 350 TPD, and 500 TPD. Large factory setup near Delhi NCR has in-house design capabilities for manufacturing equipments for upto 350 TPD sponge iron plant. Hobbing: It is a primary process for cutting gear’s teeth. In this process teeth are constantly moving work piece are formed by the equally spaced cutting edges of the cutting tool (HOB). The cutting tool that we use in this process is known as HOB thus the process is known as Hobbing. HOB is basically a cylindrical tool in which there are equally spaced cutting edges around its periphery. Hobbing is a machining process for gear cutting, cutting splines, and cutting sprockets on a Gear hobbing machine, which is a special type of milling machine. The teeth or splines are progressively cut into the work piece by a series of cuts made by a cutting tool called a hob. Firstly, the HOB and the work piece are adjusted such that the HOB cut the periphery of the work piece according to the requirement. Generally, the HOB is placed axially to the work piece so that the teeth being gradually formed as the tool traverses the work face. Now, both the element i.e. HOB and work piece are rotated relatively to each other. The motion of the HOB and work piece should be in continuation and timed relationship. The speed of the HOB and Work Piece are so that when the HOB completes one revolution, the work piece should move as a distance of 1 pitch only. In the end, we will get the gear of desired teeth. Below shared image clearly shows the relative motion of HOB and Work Piece. Hobbing process is widely used due to its versatility of producing a variety of gears including Splines, Spur, Helical, Worm Wheels etc. The hobbing process gives a higher rate of productivity rate than any other process. One of the most important concept about Hobbing process is that the Hobbing process is a generating process. Generating process means that the shape of the resultant gear teeth is not the conjugate form of the cutting tool rather it is generated by the combined and repeated motion of work piece and the HOB. We at as a leading Gears Manufacturer, Supplier and Exporter of Industrial Gear. We have an expert team of skilled engineering who use Hobbing process in order to manufacturer Spur, Helical Gears. We have expertise in the manufacturing of gears from 10 mm to 1000 mm. We manufacture all types of Industrial gears according to the standard size and according to the requirement by the customers. The recent development in sugar manufacturing technology results in superior quality sugar mill equipments that are employed in processing sugarcane. There are comprehensive collection of heavy duty equipments that are used in Mill House section includes Mill containing DC drives, Rake elevators / Rake carriers, Swing model Cane Fabrizor, Cane chopper and many more. All these sugar machineries can be developed in such a way that they are capable of carrying out both conventional method mill gearing process with the help of steam turbine or with the help of electric speed motor which acts as prime mover. One can also make use of electro mechanical drives or remote electro hydraulic or shaft mounted drives. In order to get rid of various drawbacks set by Cutter and Kicker, Cane Chopper was designed with various advantages like: unique design chokeless hood, large quantity of cane cutting and throw back process, functions as feed metering device too. Swing Type Cane Fibrizor was designed to attain 85 P.I and also towards the purpose of faultless installation on previously existing carrier containing pocketed Ancil of 1650 wrap angle. These kind of modern Fibrizor shows increased efficiency across various sugar manufacturing plants in India. Rake elevators / Rake Carriers are deployed to shift crushed cane between 1st and last Mill thereby aid to feed at Mills instantaneously. DC drive Mill leads to less electricity consumption and minimum apex angle together with less pressure chutes. TRPF /GRPF deliver less contact angles, better feeding of Mill, economical power consumption, enhanced cutting rate and thereby increased juice extraction. One can also shift to 5-roller from 3-roller with less shifting, decreased foundation modifications and drive gearing. Rotary Juice Screen requires less space, chances of automated cleaning, minimal maintenance, no need for online adjustments, less supervision, no chance for screen choking, less electricity requirements, possess ability to work even at decreased crush rate without altering its efficiency, keeping aside static screens and many more. Mill House Cranes can be designed according to the requirements of individual customers. Thus all equipments that are needed in Mill housing section of Sugar manufacturing plant can be designed and developed as per the requirement of individual manufacturers.